Smith's Diamond Bench Stone offers the ultimate in sharpening technology. The stone features multiple layers of micron-sized diamonds that are securely bonded in nickel to a flat metal surface, which creates a cutting surface that is uniform and true. Smith&apos;s Diamond Bench Stone offers the ultimate in sharpening technology. The stone features multiple layers of micron-sized diamonds that are securely bonded in nickel to a flat metal surface, which creates a cutting surface that is uniform and true. Since diamonds are one of the hardest substances known to man, they provide an aggressive cutting feature that will sharpen all types of steels quickly and easily. The oval shaped holes collect and hold the metal filings which ordinarily build up during the sharpening process. This innovation allows the diamond abrasive to remain clean and clear. 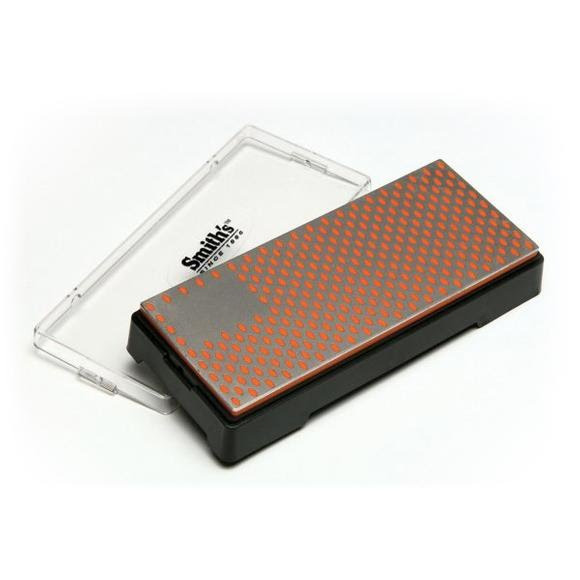 This enables you to aggressively sharpen a knife or tool edge. The Fine Stone (orange) is ideal for putting a razor sharp edge on your knife or tool. Fine diamond stone finishes your edge. Molded pastic base with non-slip rubber feet for safey. Clear plastic lid protects the stone. Micro-tool sharpening pad for small tools.